This one-of-a-kind was inspired by several versions of "stallion" weathervanes with my version being a bit less serious. (imagine that!) 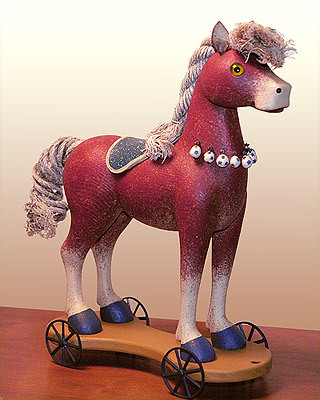 Carved from pine it features glass eyes, leather ears and saddle, and a tail and mane fashioned from pieces of old rope. The ornaments are made from paper clay and painted white with blue stars.